The Rhind papyrus is a papyrus scroll, approximately 32 centimeters (13 inches) wide and 200 centimeters (78.5 inches) long, found in a tomb in Thebes, which is the most valuable source of information we have about Egyptian mathematics. The scroll was bought at a market in Luxor in 1858 by a 25-year-old Scotsman, Henry Rhind, who went to Egypt for health reasons and became interested in archeology. After his early death at the age of 30, the scroll found its way to the British Museum in London in 1864 and has remained there ever since. It is often referred to as the Rhind mathematical papyrus, or RMP for short. The hieroglyphs on the papyrus were deciphered in 1842, while the Babylonian clay-tablet cuneiform writing was deciphered later in the nineteenth century. The text begins by stating that the scribe "Ahmes" is writing it (in about 1600 BC, and is thus the earliest named individual in the history of mathematics) but that he has copied it from "ancient writings," which probably go back to at least 2000 BC. Although there is some strictly practical mathematics on the papyrus, including calculations needed for surveying, building, and accounting, some of which involve Egyptian fractions, many of the problems in the RMP take the form of arithmetic puzzles. One of these is: Seven houses contain seven cats. Each cat kills seven mice. Each mouse had eaten seven ears of grain. Each ear of grain would have produced seven hekats of wheat. What is the total of all of these? This is very similar to the St. Ives problem. 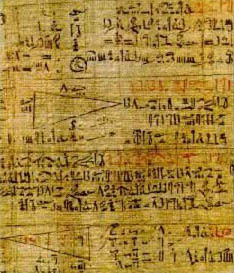 There are also four lesser documents preserving Egyptian arithmetic: the Moscow papyrus and the Berlin papyrus (named for the places they are kept), the Kahun papyrus (named for where it was found), and the Leather Roll (named for its composition). The Moscow papyrus is sometimes called the Golenischev papyrus after the Russian V. S. Golenischev, who purchased it in 1893 from two Egyptian brothers who found the tomb at Deir el-Bahri. It measures 8 centimeters high and 540 centimeters wide and contains 25 problems and their solutions. The most unusual are the tenth, which seems to give the area of the surface of a hemisphere, or perhaps a cylinder, and the fourteenth, which gives the formula for the volume of the frustum of a pyramid.